Curving north along the Genesee River through the city is the Plymouth Exchange – PLEX – Neighborhood, a blend of college students and families who take pride in their urban community. Close to downtown and the University of Rochester River Campus, PLEX is experiencing a surge of redevelopment, including not one but two stages of the Brooks Landings development bringing even more retail and restaurants into the Jefferson Avenue hub, and additional housing options such as Carlson Commons and Plymouth Manor. The University of Rochester’s new Riverview Student Apartments is engaging U of R students in more than just living on the west side of the river– they are increasingly involved in the life of the neighborhood. Genesee River Park on the river offers trails for pedestrian and bicycle connections to downtown, UR, Genesee Valley Park, and the Erie Canal. Plymouth Avenue, the commercial spine of PLEX, boasts some of the neighborhood’s largest and most impressive housing stock for both renters and buyers. Organized into the Southwest Common Council, community organizations and neighbors work together. Many initiatives promote urban agriculture, and numerous vacant lots have been transformed into gardens, bringing new life to the riverside. The Seedfolk City Farm has established a west side campus at 929 South Plymouth Avenue featuring an outdoor garden includes nearly 20 raised beds, an active compost system, and permaculture practices. Plans are underway for a neighborhood Sustainability Campus through a partnership with In the City/ Off The Grid and will feature an aquaponic greenhouse. The non-profit Sweet Beez, Inc., dedicated to building community here, and internationally, via staunching the decline of bees, is carrying out beekeeping in the neighborhood in partnership with Foodlink, the major community institution that fights hunger in western New York. And the entire City of Rochester benefits from local Community Composting, an innovative new business located here that provides an integrated composting solution linking residential customers with local farmers to enrich the soil and grow great food. A look at their website at communitycomposting.org will tell you that so far, they have diverted over 326,047 pounds of compost from the landfill! A current focus in PLEX is the renovation of an empty Exchange Street industrial building by the Church of Love Faith Center. Stunningly transformed, the former church has become a community center that can seat accommodate 800 people featuring a sun-drenched foyer overlooking the Genesee River and Ford Street Bridge. Recently, the M.K. Gandhi Institute for Nonviolence moved into a long-vacant house on Plymouth Avenue. Another impressive community foundation is the Genesee Valley Little Leagues. GVLL has been providing the opportunity to boys and girls to play organized youth baseball since 1955. They communicate clearly that although times have changed, GVLL remains true to their original mission of providing learning and life skills—and fun– through Little League baseball. Can’t leave out a mention of Brue Coffee the coffeehouse the neighbors liked so much that they bought it! Or the close proximity to the Westside farmer’s seasonal market. 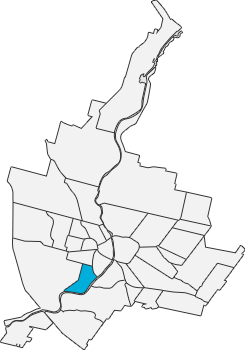 A giant community partner is the University of Rochester, committed to the southwest quadrant of the city it calls home. The U of R backs the work of the community with general support as well as with specific projects. Most recently, the U of R rehabilitated the historic Erie-Lackawanna Railroad Bridge crossing the Genesee River, adapting the bridge for use as a bike and pedestrian walkway which now connects the University of Rochester campus with the PLEX neighborhood. 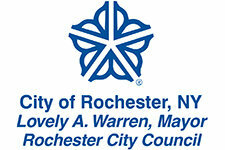 PLEX and other southwest quadrant community stakeholders are also partnering with the City of Rochester in carrying out the renewal of land under the Vacuum Oil BOA project, and for a wealth of information, the City webpage at cityofrochester.gov/VacuumOilBOA outlines not only the physical development plans and schedule but also the detailed resident engagement strategy for revitalizing this renewed land for best community usage. Hungry? 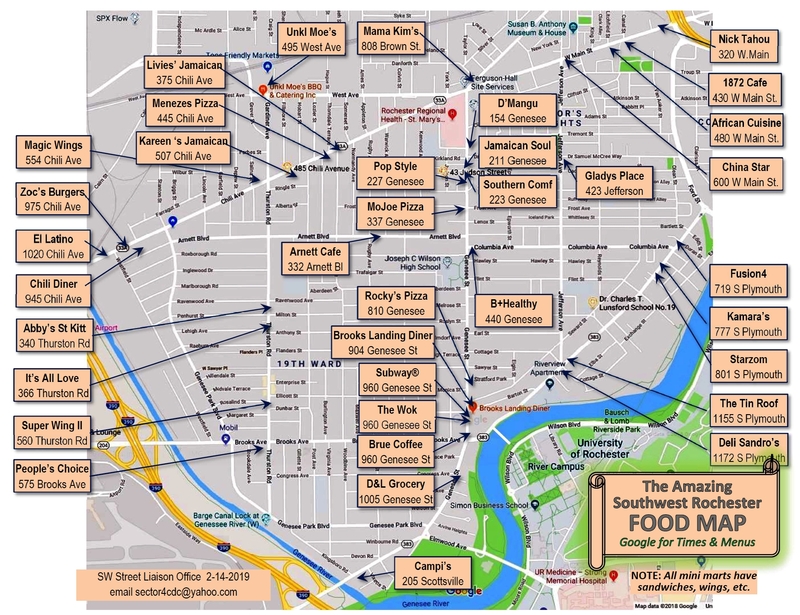 Try the Southwest Food Map!